Hometown: Passaic, New Jersey, U.S.
Died: August 12, 2004 in Operation Iraqi Freedom. 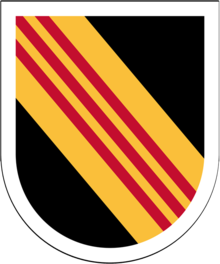 Unit: Army, 1st Battalion, 5th Special Forces Group, Fort Campbell, KY.
Capt. Michael Yury Tarlavsky, 30, of Passaic, New Jersey died in Najaf, Iraq, when his unit came under small arms fire and grenade attack. He was assigned to 1st Battalion, 5th Special Forces Group, Fort Campbell, Kentucky. Michael was born in the Republic of Latvia, a part of the former Soviet Union. His family moved to the United States in 1979 when he was 5, settling first in New Orleans. They moved to Clifton in 1986. He was awarded the Bronze Star and the Purple Heart. Capt. 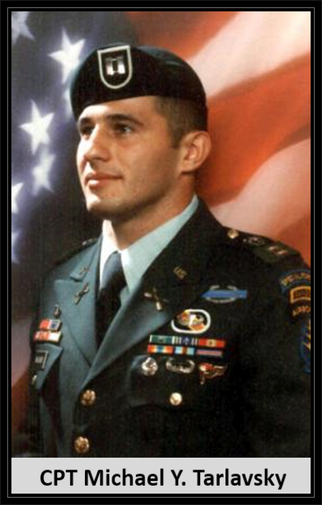 Michael Yury Tarlavsky, 30, was a Special Forces officer assigned to Company A, 1st Battalion, 5th Special Forces Group (Airborne), Fort Campbell, Ky.
Tarlavsky, a native of New Jersey, was born on May 5th, 1974. 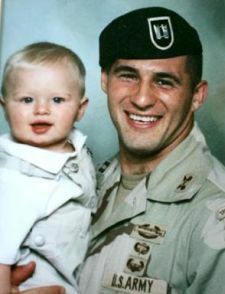 He was fatally wounded in action on Aug. 12, 2004 in Najaf, Iraq when his unit came under small arms fire and grenade attack. He entered the Army in July of 1996 as an infantry officer and completed the Special Forces Qualifications Course at the U.S. Army John F. Kennedy Special Warfare Center and School, Fort Bragg, N.C., in 2001. He then moved to his first assignment as a detachment commander in Company C, 1st Battalion, 5th SFG. He has deployed in support of the Global War on Terrorism to both Afghanistan and Iraq. His awards include the Bronze Star Medal, Army Commendation Medals, Army Achievement Medals, Joint Meritorious Unit Award, National Defense Service Medals, Global War on Terrorism Expeditionary Medal, Global War on Terrorism Service Medal, Korean Defense Service Medal, Army Service Ribbon and Overseas Ribbon. He also earned the Air Assault and Parachutist Badges, as well as the Ranger Tab. 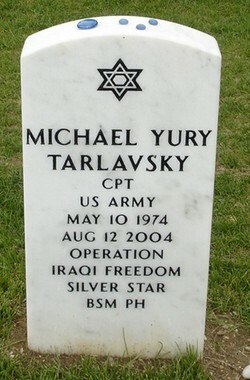 Captain (Infantry) Michael Yury Tarlavsky, United States Army, was awarded the Silver Star (Posthumously) for conspicuous gallantry and intrepidity in action against the enemy while serving with the 1st Battalion, 5th Special Forces Group (Airborne), during combat operations in support of Operation IRAQI FREEDOM, on 12 August 2004, in Iraq. Captain Tarlavsky distinguished himself when his unit came under small arms fire and grenade attack in Najaf, Iraq. His gallant actions and dedicated devotion to duty, without regard for his own life, were in keeping with the highest traditions of military service and reflect great credit upon himself, his unit, and the United States Army.